Sunshine x 3: Show & Tell: Do you want to build a Snowman? Happy last Thursday of October! Wouldn't you want to build a snowman or ride your bike around the hall in one of these pretties? We love love Lisa's take on Princess Anna's cape. Of course, it could easily look like an Elsa cape too... just change up the colours and whala! The ribbon, the pom-poms, the frogs... so pretty and fun all at the same time. The pattern is clear and simple - really we had no trouble other than keeping those pom-poms out of the way! And the results are awesome! The girls adore them and will most days come home from school, get changed and put their cape's on... A very definite hit! If you'd like to make an Anna inspired cape, head to the Big Little Shop! Until the end of October you can get 15% off too - just use the code ANNAL15 at checkout. So what delights have you been working on? Getting your Christmas craft on? PS: We found the frogs at Ike's Emporium in Henderson (Auckland). 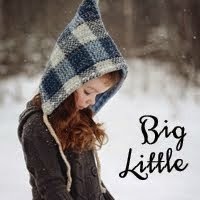 How funny - I was looking at BigLittle earlier this week, and thought how nice all the designs were. I think I was attracted by the embroidery, and totally overlooked this cute cape. Oh soooo pretty, does Lisa have them in big girl princess sizes! Those are just gorgeous! I might just have to make one for my niece. Beautiful capes! Love the pom pom trim. How cute are these!! I love that you made 3 of them. Being of the none frozen variety I have no idea what colours they 'should' be but knowing you they will be perfect. So sweet! These are so cute, how you made time to sew three when I couldn't even find time to make one is unspeakable. Unspeakable. Gorgeous x 3.